Boris Johnson has used his first intervention in the election campaign to mount the Conservatives' most personal attack yet on Jeremy Corbyn. Writing in The Sun, the foreign secretary accused the Labour leader of being a threat to the UK and described him as a "mutton-headed, old mugwump". He cited Mr Corbyn's previous comments on nuclear weapons and Nato. Labour said it was the sort of "look at me name-calling you would expect in an Eton playground". On a visit to Harlow in Essex, Mr Corbyn said: "We're eight days into the election campaign and the Tories have reduced to personal name calling. I've never been involved in that and never will be." The Oxford English Dictionary defines a mugwump as someone who remains aloof or independent, especially politically. In a deeply personal attack on Mr Corbyn, Mr Johnson said people did not realise the "threat" posed by the Labour leader. "They say to themselves 'He may be a mutton-headed old mugwump, but he is probably harmless'," he writes. Mr Johnson suggested that with Mr Corbyn as prime minister, Britain would be ill-equipped to deal with an assertive Russia, North Korea's "semi-deranged regime" and so-called Islamic State, which he described as an "evil Islamist death cult". "He seems to have no grasp of the need for this country to be strong in the world," he said. So far in this election campaign, Boris Johnson has had an unusually low profile. So low in fact that there were claims he had been deliberately sidelined by Downing Street. In a speech in London, the foreign secretary claimed that the leadership of Theresa May would keep Britain safe. And in an article for the Sun, he argued that the leadership of Jeremy Corbyn would not. This campaign may have many weeks to go but it has already got personal, deliberately so. The Labour leader has insisted he supports Britain's armed forces. In an interview on Sunday, Mr Corbyn said he would not recall 850 British troops sent to Estonia as part of a Nato deployment on Russia's eastern flank - one of its largest in decades - but also wanted better relations with Moscow. He said he was opposed to the "first strike" use of nuclear weapons and did not believe the renewal of Trident was a solution to the world's problems. Labour, however, has insisted it remains committed to keeping the UK's deterrent in its current form and the pledge will be in its manifesto. 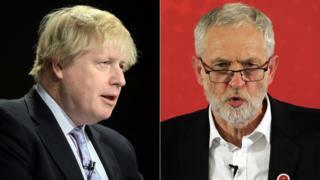 Shadow housing secretary John Healey said Mr Johnson's comments about Mr Corbyn were "look at me name-calling you would expect in an Eton playground". "I think it demeans the position of Britain's foreign secretary and I'd say to him.. on a serious point, don't attack the person, debate the policies, get your leader to do that on TV with Jeremy Corbyn", he told Radio 4's Today. Image caption The shadow foreign secretary said Mr Johnson was talking "delusional nonsense"
Shadow foreign secretary Emily Thornberry said Mr Johnson - a key figure in the Vote Leave campaign in the EU referendum - had played his part in the "greatest diminution of British influence on the world stage in a generation". "It seems Boris Johnson has finally been allowed out of hiding, on the condition he only talks delusional nonsense. "He talks up a fantastical vision of Britain as a global trading nation, yet he and Theresa May are putting at risk our trade with the EU - by far our largest trade partner - by threatening an extreme Brexit where we crash out on WTO terms. "With his crass and offensive remarks, Boris Johnson has single-handedly damaged Britain's chances of getting a good deal with the EU." Mugwump and Boris Johnson: What meaning did he intend? 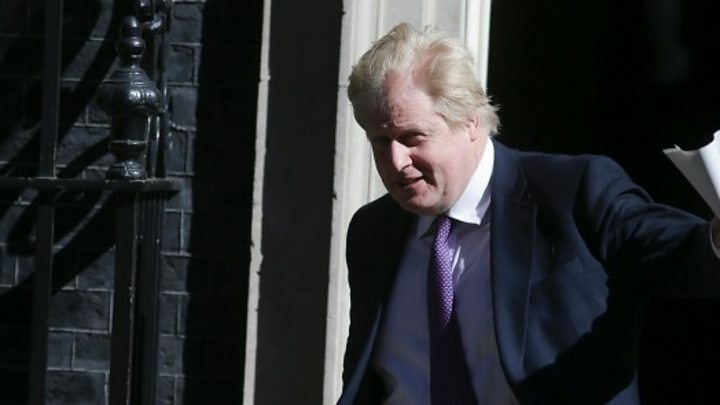 Boris Johnson: A weakened foreign secretary?